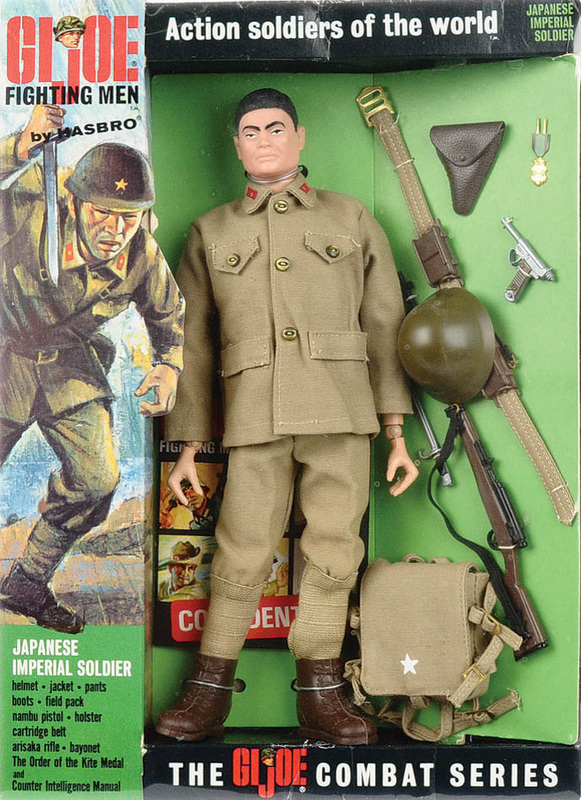 The Japanese Imperial soldier has a unique head sculpt with Asian styled features. There are examples of a very rare, possibly prototype, body for the figure cast in yellow plastic. When found they bring very high prices. Note that the figure in the spin above has a tent added to his accessories; this was not an item original to the set, though the Japanese pack has steps for attaching a tent or bedroll. The set was available in a deluxe window box (8101) and as a narrow figure box (8201) and a carded set of accessories (8301). 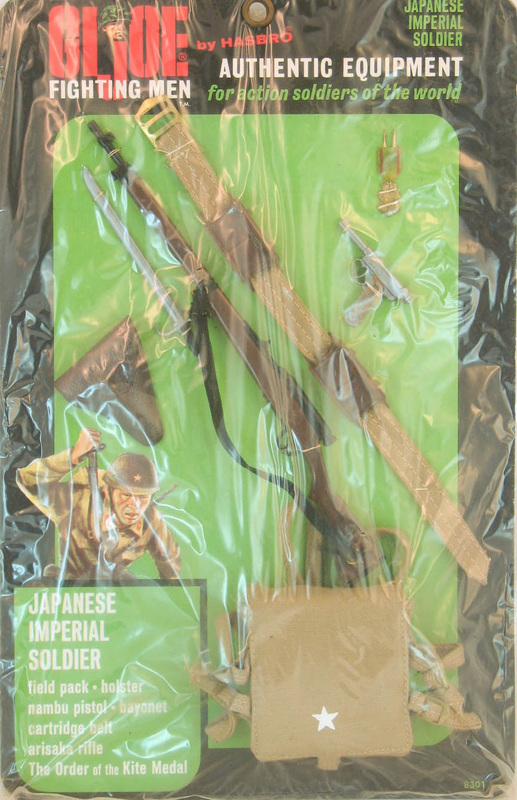 The small box version of the Japanese Soldier, with the corresponding accessory card. This figure box has been re-cellophaned. Note the small tab on the box front with the image of the soldier. These are often missing from loose boxes. The Japanese accessories are pictured below, again with the additional tent on the pack. The medal and bayonet have been widely reproduced, so be careful when buying. There is a very rare variation of the basic Japanese figure with the body molded in yellow plastic. There has long been speculation about these figures as there is no extant documentation on their creation. It is clear that they were a very sort-run version as only a handful have turned up in the market. Muddying the water further are a few fraudulent examples made to deceive unwary collectors. These are sometimes put together from faded standard bodies, or even bodies soaked in a dye bath to color them a yellow shade. It is possible the is body color was cancelled after just a few hundred were made because of potential concerns of racial insensitivity. The rare example shown comes courtesy of Joezeta. 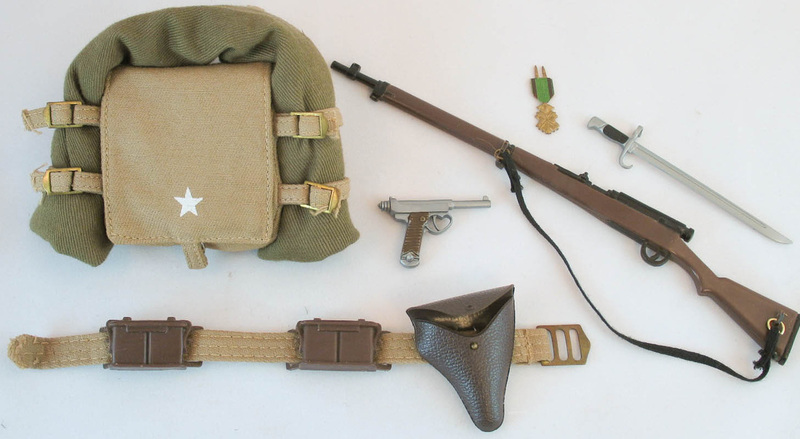 See his GI joe items available at auction here! Uniforms are found with yellow buttons more tightly spaced, or wider spaced green buttons. 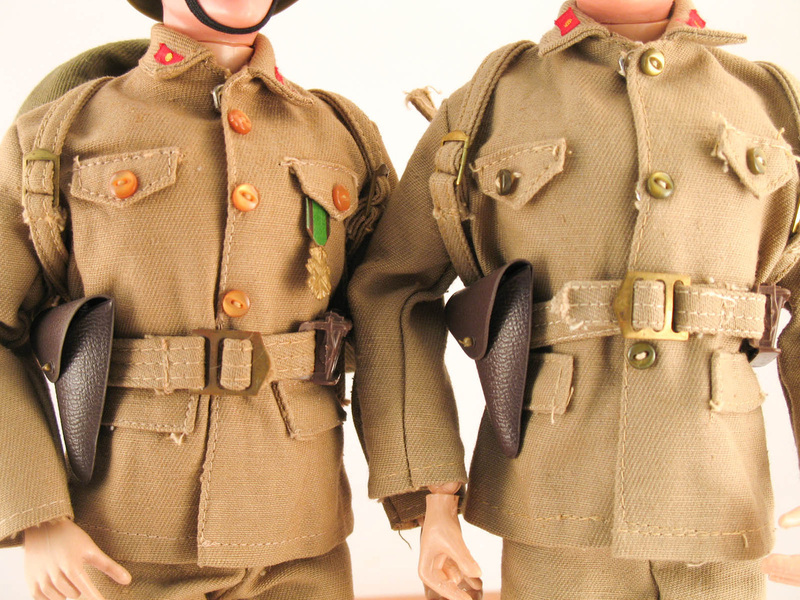 the fabric can be a slightly more yellow tone as on the left above or more khaki as on the right. The elastic gaiters on the bottom of the pants are sometimes slightly lighter than the rest of the pants.